The TB303's sequencer controls the synth section via a 6-bit digital to analogue convertor for note CV, and three digital control lines for GATE, ACCENT and SLIDE. 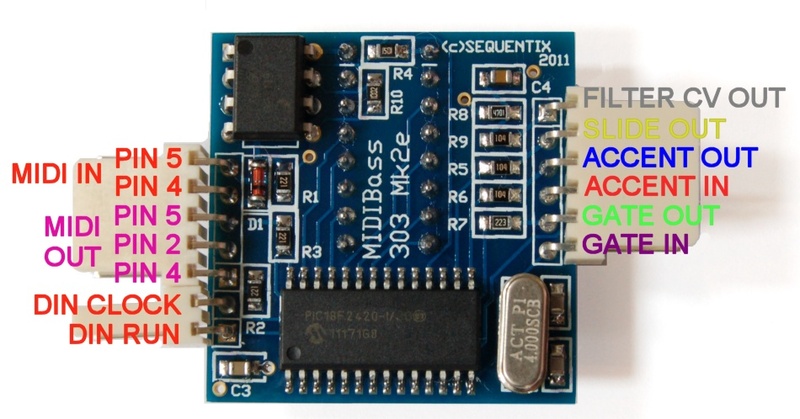 The MIDIBass board intercepts these control signals while they are still in the digital domain, to allow the pattern data from the 303 sequencer to be transmitted as MIDI note output, and to allow an external sequencer to drive the 303 synth section exactly as if it were being driven by the 303 sequencer. It also has bi-directional connections to the 303's DIN sync signals, so it can either synchronise the 303 sequencer to external midi clock, or generate midi clock output from the 303's internal timebase. With the revised SYNC connections, it can also generate MIDI clock from an external DIN sync source. N.B. The Mark II board is now at revision IIe. The original Mark II boards are BLACK, the Mark IIb and IIe boards are BLUE. The only difference for installation is that the ACCENT IN and OUT wires are swapped. This image shows the Mark IIe board. Installation is the same for IIb & IIe - but note the revised SYNC connection details which apply to all versions. Click here for the original Mark II board image. The board has a 16 pin DIL header, and three connectors for direct wiring. 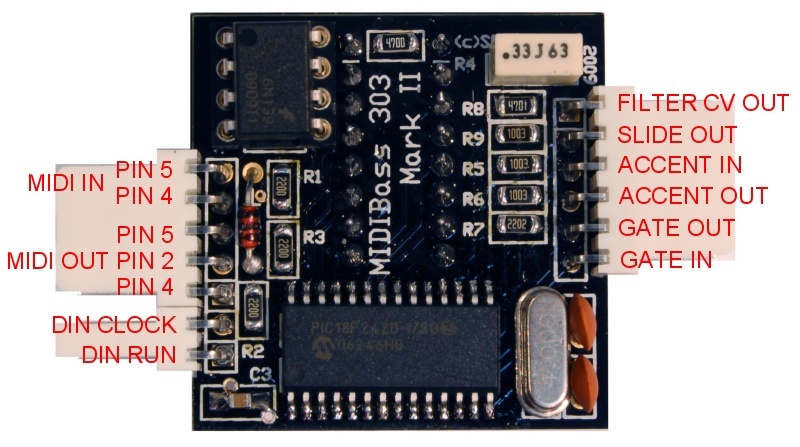 The 16 pin header allows the MIDIBass board to take the place of the 4174 latch used in the 303 as part of the digital to analogue convertor that generates the note CV. The 6 pin connector on the right side has two wires that intercept the GATE control signal, two wires that intercept the ACCENT control signal, one wire to drive the SLIDE circuit (the SLIDE signal from the CPU is on the 16 pin header, so does not need an input wire), and a CV output for filter control.. The two pin connector interfaces with the 303's internal DIN sync RUN and CLOCK signals - these pins switch from input to output mode as necessary. The other 5 pin connector provides the MIDI in and out connections.